Zendesk on Wednesday unveiled an extensively reworked version of its online help-desk software, in a bid to shove aside competition from the likes of Salesforce.com's Desk.com and Freshdesk. The "new Zendesk" includes a Facebook-like user interface that helps service agents work faster to resolve calls and customer complaints. "Speed was a primary theme," said JD Peterson, vice president of product marketing. "We wanted to do everything we could to make the software not get in the way." Zendesk has more than 20,000 customers, ranging from small companies to large enterprises, he said. The latter group includes companies such as Sears and Xerox, which are using Zendesk on a departmental basis. But newer companies, including Groupon, are using Zendesk as their strategic help-desk platform, he said. Some of Zendesk's customers have "floors full of support people" answering customer queries, he said. "If we could save them even a couple seconds on each ticket, over time and millions of tickets, it can add up." Zendesk is now a "single-page" application, with an activity stream on the sidebar giving agents a view of updates to open tickets. Their main view shows tickets requiring their attention, and places the most important ones higher up. Once a ticket is resolved, the next most important one is automatically pushed to the agent. If an agent is working on multiple tickets at once, they can be organized in tabs like a web browser would hold a series of pages, rather than spawning a potentially confusing array of new windows, Peterson said. Zendesk has also catered to the wishes of power users: The new interface is accessible via keyboard shortcuts, with no need to touch a mouse, if desired. "For our power users, this saves a lot of time and effort," Peterson said. Other new features include a new framework, Zendesk Apps, that allows Zendesk users to integrate third-party applications. Zendesk has also improved the application's content search function and now offers localization in "more than 11 languages," according to a statement. The new interface comes at no additional charge to subscribers. It's also optional, and Zendesk plans to continue supporting the earlier version "for the foreseeable future, and probably for a very long time," Peterson said. This will allow customers to ease into the transition, perhaps by having a handful of agents work with the new version first, he added. 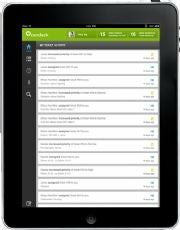 Zendesk is also planning to hold free weekly training sessions and has "very rich documentation" for the update. "We're not going to rush people," Peterson said. Also Wednesday, Zendesk said it had raised US$60 million in new venture financing, as it reportedly prepares to file for an IPO.